Yes, Emacs is no ordinary text editor. It’s an operating system, a religion, an entire universe unto itself. Here are a few other winners. …and that’s just the built-in ones. Want to get really crazy? Take a look at the add-on packages. 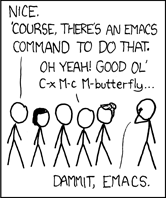 We’re laughing with you, Emacs, not at you, promise! We kid because we love. Reddit found a few more. Of course!